Corticosteroid triamcinolone acetonide increases knee cartilage destruction. 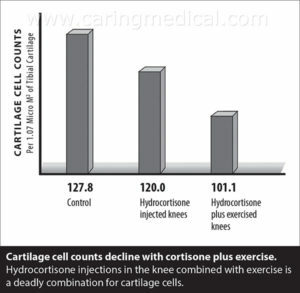 Cortisone injections increase the risk of joint surgery. Cortisone injections increase the need for secondary surgery and possible higher risk for post-surgical infections in the joint. Corticosteroids can alter the healing environment of the joint by effecting damage on the native stem cells in cartilage. Do you have a question about finding an alternative to cortisone shots? 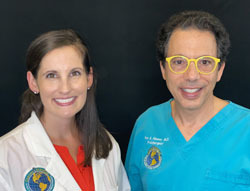 Get help and information from our Caring Medical staff. New research is providing more warnings that cortisone does not heal and, in fact, accelerates deterioration of already damaged joints. The fact that new research is pouring in on the detrimental effects of cortisone injections should not convince anyone that suddenly medicine is being alerted to the risk of corticosteroids. The dangers of cortisone injections have long been known. But in eagerness by health professionals and the patients themselves to get instant relief, the dangers were accepted as part of the treatment, the let’s manage the pain until the patient is ready for joint replacement treatment. cartilage surface deterioration including edema, pitting, shredding, ulceration and erosions, etc, etc. Corticosteroid damaged knee cartilage and provided no significant pain relief after two years. The idea that cortisone can cause damage was not an easy sell for some researchers. Corticosteroid injections have been used for a very long time. Their anti-inflammatory and pain relief properties made its use a common practice within the medical community. Further, they are effective. Corticosteroid injections have been shown to be effective in decreasing the inflammation and pain of ligament injuries for up to 8 weeks; however, these same properties lead to the destruction of cartilage as mentioned above. Simply, the body heals via inflammation, cortisone inhibits inflammation and healing by disrupting the three characteristic phases: inflammatory, proliferative and remodeling. 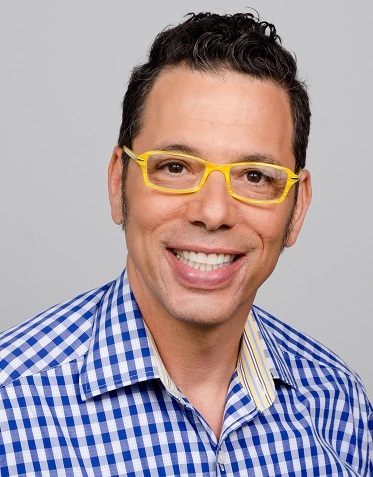 The first phase, the inflammatory-reparative phase, sets the stage for the others and is critically affected by the treatment options chosen. These options can either block or stimulate the healing process. In other words, cortisone can either work or make the problem worse. Cortisone as well as other anti-inflammatories, and the RICE (rest, ice, compression, and elevation) protocol– which has very recently been rescinded by its author due to its detrimental effect on healing all are considered “non-healing,” and whose long-term usage will make the patient’s condition worse. Recent research from the Mayo Clinic says cortisone may hinder the native stem cells in cartilage. (Mesenchymal stem cells (MSCs) are the building blocks of cartilage other musculoskeletal tissue.) Cortisone threatens their innate regenerative capacity in exchange for temporary analgesia. (3) Please see our article on How stem cells heal degenerative joint disease after years of cortisone and painkillers. At three weeks after the cortisone treatment, the patient’s stem cells could not help generate the construct needed for the cartilage/bone patch. It is the message over and over – When injected into joints, corticosteroids not only trigger cartilage cell death but also completely suppress healing by their innate mechanism of action, which is to suppress the immune system and block inflammation. Despite the research, the first trip to the joint pain specialist is usually a recommendation to cortisone. Shortly after doctors started injecting cortisone and other steroids into knee joints in the 1950s, researchers began noting severe problems of joint degeneration and so discouraged the use of cortisone injections. Today, despite the dangers, cortisone use remains widespread as a standard of care. Cortisone has a harmful effect on soft tissue healing by inhibiting blood flow to the injured area, suppressing new blood vessel formation, suppressing growth of immune cells like leukocytes and macrophages, preventing protein synthesis, fibroblast proliferation and ultimately collagen formation. Cortisone inhibits the release of growth hormone, which further decreases soft tissue and bone repair. Cortisone weakens collagen and therefore soft tissue such as ligaments and tendons. (My comment, good for one week, damages stem cells for three weeks, referring to above research). (My comment: Cortisone is clearly not part of the Future directions for the management of pain in osteoarthritis). In March 2017, Italian researchers publishing in the medical journal Expert Opinion in Drug Safety noted: local glucocorticoids injections have shown positive results in some tendinopathies but not in others. moreover, worsening of symptoms, and even spontaneous tendon ruptures have been reported. (9). Cortisone injections can predispose a joint to infection. Patients have reported severe pain, including muscle pain, and burning after a cortisone injection. In research from 2015, doctors at the University of Toronto wrote of the problem of injection infection. HERE IS THE DIFFERENCE -Patients prior to hip replacement surgery may typically receive hip injections of corticosteroids and hyaluronic acid to manage their pain until surgery day. Intraarticular hip injections of corticosteroids and hyaluronic acid may increase the risk of infection because of the immune system suppression characteristic of cortisone. Therefore, in the setting of total hip replacement, preoperative receipt of a hip injection may increase the risk of infection, leading to early revision arthroplasty. While the researchers were unable to determine what agent was injected into the joint prior to surgery, they concluded that the most likely therapies were corticosteroids and hyaluronic acid, with or without a local anesthetic. As hyaluronic acid has no proven benefit for hip osteoarthritis, it is likely that most of the injections were of corticosteroids. Corticosteroid joint injection may have local immunomodulatory effects that may increase the risk of infection following hip replacement. In new research, doctors in China released their findings on animal studies on the damaging effects of cortisone on cartilage and the ability of hyaluronic acid to repair this and other damage. 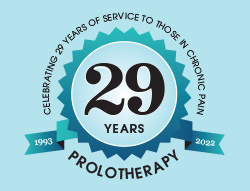 Prolotherapy is an alternative and effective treatment to heal chronic musculoskeletal injuries. Comprehensive Prolotherapy involves the injection of natural substances (named orthobiologics) used to induce healing within the body. There are two types of orthobiologics: those that come from the body (i.e. 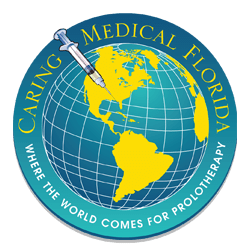 cellular Prolotherapy such as Platelet Rich Plasma Therapy, bone marrow, and adipose tissue) and those that naturally induce healing, such as dextrose (a chemical equivalent to normal d-glucose that is found in the body). Dextrose is a heavily studied proliferant and is extremely safe and effective. It can be used in high concentrations without threatening side effects. This allows us to treat multiple body parts on the same person during the same visit. 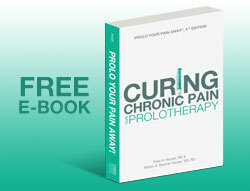 Comprehensive Prolotherapy stimulates, rather than interferes with, the normal healing process of inflammation. While corticosteroids inhibit the enzymes that block the production of prostaglandins and leukotrienes, which mediate the inflammatory process, Prolotherapy stimulates them. In addition, the collagen that forms in ligaments and tendons treated with cortisone is disrupted and weaker, while that treated with Prolotherapy is stronger. 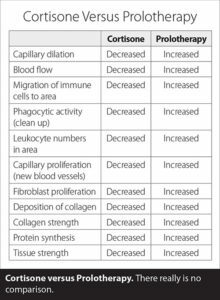 Prolotherapy provides the stimulus that is needed to bring in healing fibroblasts and allow them to proliferate and lay down new collagen fibers. This causes the connective tissues, ligaments, and tendons to become thicker and stronger. Prolotherapy stimulates the normal inflammatory-reparative mechanisms of the body, encouraging normal collagen and extracellular matrix growth. Doctors in Pakistan have shown the effectiveness of platelets rich plasma versus corticosteroids or the “tennis elbow steroid injection.” The doctors looked at 102 patients in the study and divided them into two groups of 51(50%) each. In summary, while cortisone shots weaken an injured area even further, Prolotherapy stimulates the body to repair it. Prolotherapy stimulates blood flow to the area, protein synthesis, fibroblast proliferation and ultimately collagen formation. The choice is simple: cortisone shots that lead to proliferative arthritis of joints or proliferative injections (Prolotherapy) that stimulate the repair of the injured tissue.